Effective July 1, 2013 French shops and office buildings will turn off their lights at night to save energy, save money, reduce France's carbon footprint, and reduce light pollution, announced France's Minister for Ecology, Sustainable Development and Energy, Delphine Batho January 30, 2013. It is estimated France's new lighting regulations will save enough energy to power 750,000 households, while also reducing France's greenhouse gas emissions by 250,000 tonnes a year, delivering annual savings nearing $1 billion Canadian. Exceptions will be made for Christmas lighting and other local events, and landmarks such as the Eiffel Tower or the Notre Dame Cathedral. It is hoped the rule will also reduce impacts artificial lighting can have on ecosystems, and the sleep patterns of local residents. 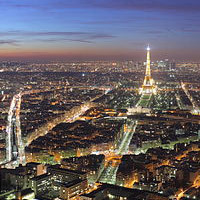 Former President Nicholas Sarkozy as part of his plan to boost energy efficiency first floated the proposal for darker skies at night in France. The government of current French President François Hollande, who defeated Sarkozy in the May 2012 French presidential election, is now implementing the proposal.